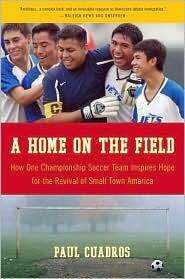 Carolina’s summer reading book for incoming freshmen is A Home on the Field by Paul Cuadros. Like most of the earlier selections in the reading program, this book offers a cultural perspective that will challenge the assumptions of many students—and the assumptions of many others who read it. It is especially relevant for us because it focuses on the impact of Latino immigrants who have come to work at the chicken processing plants around Siler City. Cuadros is a reporter who moved south to study the effects of this migration, and he ends up establishing and coaching the soccer team at Jordan-Matthews High School. The team is made up of young Latinos, and you see the immigration experience through their eyes—the prejudice, poverty, and the enormous obstacles. According to Cuadros, “What I found truly ironic about the migration of Latinos to the United States, was that it was motivated by a truly American desire. Only a real American would weigh the uncertainty against the possible gain and attempt to come to the United States.” I recognize that immigration is a hot-button issue for lots of people, and for many the question boils down to “legal” or “illegal.” Once you have seen the human face of immigration through these students and their families, including how they are treated after graduating from high school, you might be inclined to agree with Cuadros that “America has always been an idea. It has nothing to do with papers, documents, or immigration laws. It has a lot to do with ideals and dreams. And our country needs Americans like these.” Two strategic planning impact proposals recommend that the School help communities work through complex issues like immigration. It might be challenging and risky, but after reading A Home on the Field I hope we can find a way to help everyone who struggles with these issues. I had often heard stories about the horrible conditions in our local chicken processing plants – for the workers as well as the chickens! By giving a human face and voice to immigration, Cuadros gave me a new perspective about the immigrants that risk so much to make a better life for their families. I so hope SOG can be part of the solution in communities with immigration/economic issues. One immediate way that the SOG can help communities work through issues like immigration is to get this book, and a supplemental curriculum, into the hands of high school teachers. Christie has been reading the book with the plans that the NC Civic Education Consortium would conduct a training on the book in the future. After reading this blog post, we’ve decided that the Consortium needs to conduct a training on this book sooner rather than later. Look for details on a late fall/early winter teacher training on “Through Their Own Eyes: Immigration in North Carolina”! a) We should be sure to get UNC folks to have Cuadros videotaped as he does talks in the coming weeks in connection with the summer reading program (and freshmen seminars). c) More than anything else, we need to be clear what SOG’s goals are in delving into this hot topic – as a leading example of other hot topics (health care, housing, transportation funding, climate change, etc. ).